Soft, foam ear cushions provide comfort and secure fit. 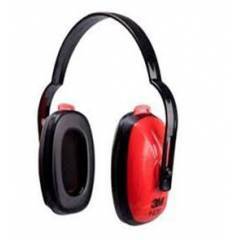 Can be worn with the headband behind the head for compatibility with hard hats. Ear cups adjust easily for a customized fit. Military Maintenance,Repair and Operation (MRO),Mining,Food and Beverage Manufacturing,Metal Fabrication,Oil & Gas,General Manufacturing. Great product from 3M - they don't cut all the sound but a good job when using powertools etc. They are a bit bulky and sometimes they get knocked whilst on my head which is annoying in tight spaces, rest is great.